California State University, Northridge will host back-to-back events next month that will explore the potential of exceptional learners. On Monday, Feb. 6, world-renowned author and autism spokesperson Temple Grandin will discuss how different kinds of minds contribute to society as part of CSUN’s Education on the Edge lecture series – an event that already has sold out. The following day, on Tuesday, Feb. 7, the university will host a daylong conference to explore “What Really Works with Exceptional Learners.” Speakers will discuss strategies for working with students who have disabilities, are English-language learners, gifted, struggling with identity or mental health issues, or are typical learners with other special needs. “Having Temple Grandin here is a real boon for CSUN,” said Wendy W. Murawski, executive director and Eisner Endowed Chair of the university’s Center for Teaching and Learning. “We genuinely hope that the 700 people who are expected to come to hear her speak about her experiences with autism will then attend the next day’s conference in order to learn concrete strategies for working with friends, siblings, students, children, colleagues and others who are exceptional learners as well. 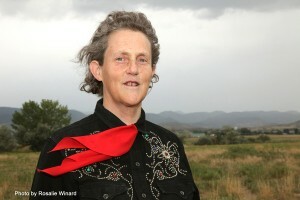 Grandin’s Education on the Edge lecture is scheduled to take place from 7 to 8:30 p.m. on Feb. 6 in the Northridge Center of the University Student Union, on the east side of the campus, located at 18111 Nordhoff St. in Northridge. The free event already has reached its registration capacity. Interested individuals can get on a waiting list by emailing ctl@csun.edu. During her CSUN presentation, Grandin will discuss how individuals with autism spectrum disorder have different ways of thinking. Some are photorealistic visual thinkers, others are pattern thinkers who view things spatially, and still others think verbally. Grandin argues that society needs all these different kinds of minds engaged in solving problems, and that people with unique ways of thinking can successfully work together. The What Really Works with Exceptional Learners conference is scheduled to take place from 8 a.m. to 5 p.m. in the Northridge Center on Feb. 7. The conference fee is $149. CSUN students and faculty can receive a discounted rate of $99. Registration and conference information are available at www.csun.edu/center-teaching-learning/registration. The day will feature a wide range of workshops on working with exceptional learners. Parents will get a chance to learn practical strategies to use at home with their early childhood to adult-age children. Teachers will share evidence-based techniques that help with academics and behavior in the classroom for a wide range of learners. Administrators can learn from experts and peers about how to create school-wide, systemic practices that work. Students can discover tricks of the trade to use as they enter inclusive, diverse classrooms. The day’s keynote speakers will be Daniel Jocz, a social studies teacher at Downtown Magnets High School in Los Angeles and 2016 California Teacher of the Year, and alumnus Erica Rood, a part-time faculty member in CSUN’s Department of Elementary Education and a third-grade teacher at the CHIME Institute’s K-8 public charter school who was given the Presidential Award for Excellence in Mathematics and Science Teaching in 2016 by President Barack Obama.